@Angela, I think for the most part defense attorneys do their best keep their personal feelings out of the equation, but I'm sure in some cases it must be difficult. Dylan Thomas Bieniulis: "These were initially purchased by James Holmes." His initials are on the invoice and he says he recalls the transaction. If they were really not speaking with JH he would get a mistrial under ineffective counsel, no? She is coiled like a tiger just waiting to Pounce! Yes, but I still wonder how much he talks to them and what he says.. I wonder what the prosecution's plans are for proving JH was not insane. "He planned it carefully" I believe will be too weak. They are his only friends right now. He better be talking to them lol! It would be silly not to. I think it all depends on how the jury interprets the rules on what insanity consists of. agree with you @jj i think their job is just to plant the right seeds. @Angela, all the testimony from victims and others, plus the evidence they've presented so far is part of the plan to show he was not insane. However, at the end of the day, it's all about what the jury thinks and decides. Would love for my video to work again. I would think buying raw chemicals like JH did would somehow have to be reported to an authority as suspicious, especially if the type and quantity may ignite. Dylan Bieniulis "He kinda kept to himself, looked around for about 10 minutes, picked up a few items and brought them up to the counter"
@NT8...since they're still talking about the chemicals he purchased, maybe it's a model of the apartment complex he lived in? I guess we'll find out soon enough. 3 for 3 over ruled! boom boom! two in a row! FYI @Anica is working right now on the newly published court order. It basically says that a lot of contested information about correspondence involving CU, Dr. Fenton, the notebook and the ex-girlfriend are all admissible. I think evidence like this where just anybody can buy the chemicals in the Science store will incite copycats to make IEDs. judge has been a little far from the mic for my ears the last couple days.. testimony is loud compared to him. Jury asks Dylan Bieniulis about defendant's demeanor: "very quiet, very calm. beyond that, no .. uh... nothing really exciting. just very quiet and kept to himself." Dylan Bieniulis released from his subpoena. Plus JH had the science background and all. Alright, I've got things to do today. Maybe back later! Does Spengler even know what's going on. Nick Carroll asked what he saw at the theater. 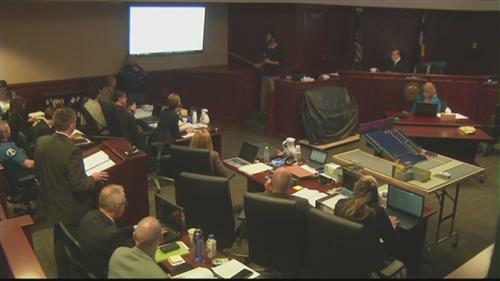 Defense objects, Prosecution argues that they are asking for his observations. Judge calls attorneys to approach.